Hugs for Hailey: Summer Nights at the Baseball Field! 3 weeks ago I received an email from the Make-A-Wish foundation inviting us to attend Make a Wish night with the Las Vegas 51's baseball team. We've never taken Hailey to a baseball game but we both thought it would be something really fun. We also want to try and participate when Make a Wish has events so that we can meet other wish kids and their families. The 51's invited the kids that attended to go out onto the field with one of the players from the team. Each child got a baseball to be autographed. Hailey wanted to walk so badly with the other kids that they also let Josh out with Hailey so that he could hold her up when standing. I LOVE this picture below! It's awesome. Cashman Field took pictures for us parents that were watching in the stands. I talked to some parents as we all watched out special children out on the field with smiles on their faces. Hailey was very excited to get her ball signed by number 24. She showed everyone she passed her baseball. We had such a great time at this game but had to cut it short. Hailey wanted to stand so much she was so exhausted only 4 innings in. It was time for bed. There were only 4 more home games left in the season and we really wanted to take Hailey at least one more time because she enjoyed it so much. One of our followers on Facebook invited us to attend another game one week later. Hailey talked about going all day. She wanted to see "my guy" the baseball player that signed her ball a week earlier. When we arrived at the field there were a few surprises in store for Hailey. She got another ball and this time signed by the WHOLE team, she got a broken bat, and was able to sit in the front row! What a happy little girl we had. Again, we had to show everyone our baseball! 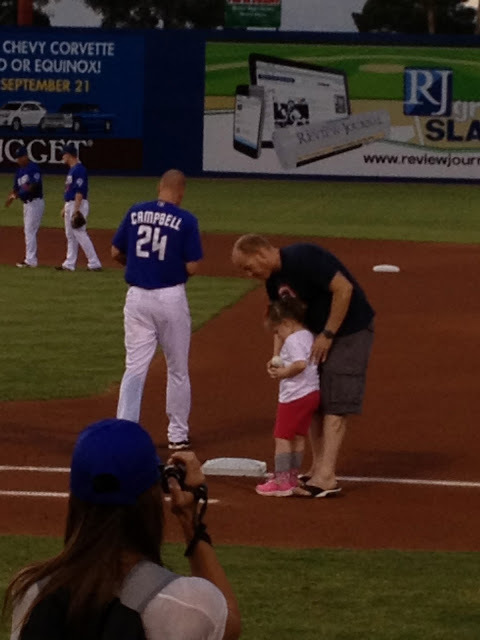 Who knew a night of baseball could put such a smile on a little girls face? She must take after me, I was one of the official score keepers for my high school baseball team for several years, and Josh and I always went to games before Hailey came along. What's a trip to the baseball game without a Hawaiian shaved ice? It was a little warm and sticky out so we all shared a shaved ice. One side pink for Hailey, and green for Josh. Hailey really wanted to use those legs to get as close as she could. She watched the players and cheered for both teams. She loved the music that played, the mini games in between innings, trying to catch t-shirts and fly balls that flew through the air, and the occasional Cosmo the mascot walk by. Thank you to Make a Wish, the Dwyer Family, and the 51's for allowing us to have more memories with Hailey. We all really had SO much fun! The staff was great, the game was great and the new friends and memories we made are so much appreciated. THANK YOU!!! !